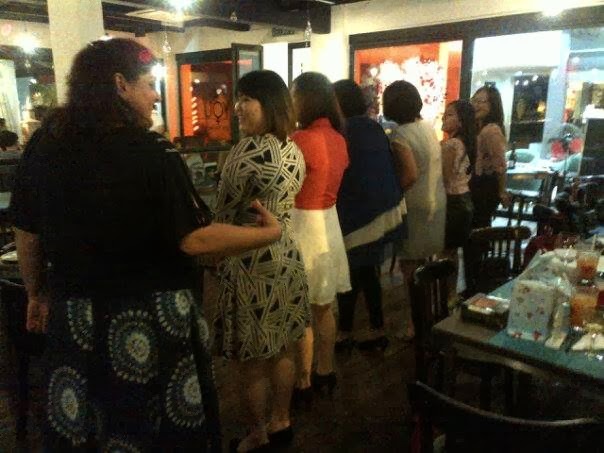 The Association of Women Lawyers, Malaysia: AWL Xmas Party and What a Party it was! AWL Xmas Party and What a Party it was! The festive season is here and last Friday, saw AWL lawyers gathering at Chef n Brew, to celebrate another good year of projects successfully undertaken, to reconnect with old friends and meet new ones. As I sat there, I marvelled at the warmth and camaraderie on display. How this year's celebrations contrasted with the first AWL Xmas party three years ago, when many were still new to AWL and to one another. I'll let the pictures do the talking! the gift at the end of the story gets to keep it. Eg. "I left my house and was on my way to Lucy Left's house..."
with 40 years of practice under their belt (ie. Ms Vicky Alahakone). bling bling jewellery and earrings. is able to pull off this look and still look chic. Ms Foo's turn at charades. The final score... losers (The Unpretentious) had to write "Merry Christmas"
with their bottoms much to the amusement of fellow patrons. Vicky and her protege, Hui Ying. L to R: Kiran (best-dressed in my book), Siu Lin, Vicky, Hui Ying, Ms Foo, Shahin. Kathly, Ida Daniella, Hui Ying, Siu Lin, Sally, Cheryl and Eliz. Any Xmas celebration would not be complete without some carolling! Dextrous Kathlyn on the keyboard. We rocked the restaurant with "Jingle Bells"! It was a fantastic and memorable evening. We look forward to a fruitful and impactful year ahead and all are welcome to help in our future projects and lead AWL to a higher platform.